URBANIZATION UNBOUND: Lecture Series organised by the Institute of Geography and Spatial Planning - Save the Dates! Lecture Series organised by the Institute of Geography and Spatial Planning - Save the Dates! Every year, the Institut of Geography and Spatial Planning organizes lecture series on a given topic. 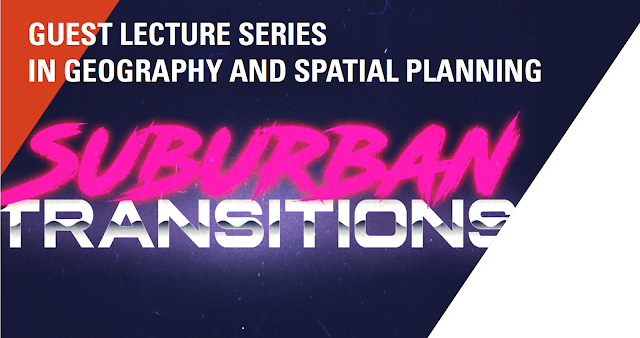 This year's theme is Suburban Transitions, covered by a range of highly prolific, renown speakers from the international geography and planning communities. Suburban Transitions is devoted to analysing spatial trends and policies in and for suburban areas. After at least two decades of densification discourses and urbanity praising, suburbs have returned to the research and policy agendas. This happens for good reason, as suburbs still represent vital parts of the city region, and they may complement core metropolitan areas in order to combat the housing crisis. What are the key functional and morphological changes that these in-between space have encountered? How can we think of suburban spaces - given their specific housing and nature mix or transport patterns - as places of opportunities to transition to more sustainable city regions? What would be the related implications for practice?